A few passing clouds, otherwise generally clear. Low 57F. Winds WNW at 10 to 20 mph..
A few passing clouds, otherwise generally clear. Low 57F. Winds WNW at 10 to 20 mph. You can’t miss the Trippin’ on Pizza truck. “It’s a real beast, it’s funky and it’s cool,” said Michael Barone. Look for Michael Barone and Bianca Hannigan in the service window of Trippin’ on Pizza. Keep an eye on Bianca Hannigan and Michael Barone, the creative partnership behind Trippin’ on Pizza. That suited Michael Barone so well that he reproduced the phrase on the psychedelic wrap that Fort Myers artist Joshua Noom designed for Barone’s new food truck. Well before the founder of Port Charlotte’s Pioneers Pizza was born, Jimi Hendrix was long gone. So was the tie-dyed 1967 Summer of Love. But that hasn’t stopped Barone from letting it all hang out in a groovy new project. 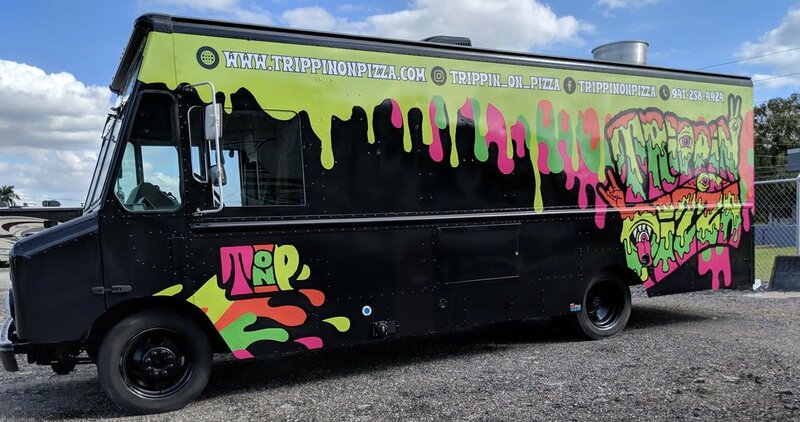 The Trippin’ on Pizza food truck, 22 feet long and custom-built to his exact specifications, has two full traveling pizza ovens with 500-pound stones and a display case holding 10 rectangular pizzas. It’s got loudspeakers pumping out music. The state inspector had never seen anything like it. Ironically, he’d felt creatively handcuffed as owner of a pizzeria so successful that it’s number 1 on TripAdvisor’s list of Port Charlotte restaurants. “I didn’t want to be a typical businessman, come in to work every day, punch a clock and crunch numbers. I want to be out there, man,” said Barone. Being stuck behind a desk, in short, isn’t his idea of passion for his craft. The inspiration hit while he and partner Bianca “Bee Sunshine” Hannigan vacationed in Italy last summer. Rome’s “Michelangelo of pizza” brought the United States its hottest new pizza phenom: Roman “pizza al taglio,” cooked in rectangular pans, sliced with scissors and sold by weight. His hole-in-the-wall Pizzarium Bonci in Rome was once the only place where one could find the uniquely bubbly slices, crispy on the outside, soft on the inside, with gourmet toppings. Then he started opening Chicago outposts in 2017 and plans a Bonci for Miami this year. His gourmet toppings are both traditional and outside-the-pizza-box, with monikers as playful as craft beers. You’ll find a cheese pizza called Good Vibes, but also Loch Ness Monster (salmon lox, crème fraîche and capers); Elmer Spuds (potato, mozzarella and chive); Ursula (octopus tentacles in Greek marinade with mozz); Hog’Warts (pulled pork, red onion and cole slaw); and Beet-Za (roasted beets, arugula, ricotta and garlic). A total of 36 topping combos will rotate on the 10-item menu board. The debut of this pizza-truck-like-no-other falls, aptly enough, on National Pizza Day, Feb. 9, 10 a.m. to 1 p.m. at the Charlotte Community Foundation’s 227 Sullivan Street “Pizza, Painting and Philanthropy,” where you can experience not just a different kind of pizza but also live painting by Port Charlotte artist Brian Joseph, known for wildly intricate psychedelic paintings; local artwork by Jay Winston, which will be auctioned off to benefit the foundation and Veterans Initiative for Therapeutic Arts (VITA); and live performance of one VITA poet’s works set to music. The same afternoon, Trippin’ on Pizza plans to make its Fort Myers debut at the Fort Myers Pizza Fest, hosted by Fort Myers Brewing Company from noon to 11 p.m. The next weekend, Feb. 15-16, they’ll be at the equally appropriate 10th annual Funk Fest in downtown Punta Gorda. Follow them on Facebook @trippinonpizza for future appearances.